Although colloquially referred to as a “Leslie”, the Leslie Rotating Speaker System is actually a sound modification (deformation) device, not a standard speaker as such, in the sense of being an amplification and reproduction mechanism, one so accurate and so realistic in its sound that the reproduction could fool one’s faithful dog. The mythic origin of the relationship between the master, the master’s voice, and the faithful dog is ancient: it can be traced back to Homer’s Odyssey, with the relationship between Odysseus and his elderly dog, Argos. If you’ll remember, Odysseus has been gone from Ithaca for twenty years, and when he finally returns, he’s disguised as a beggar. Having landed back home after such a long absence, when Odysseus eventually speaks, even after all those long years, Argos, his old, dying dog—so miserably old that the only way the beast can stay warm is lay on a composting manure pile—instantly lifts up his head in excitement, having recognized his master’s voice. The presence of his master’s voice, of course, means to the dog that his master has finally returned. Thus Nipper, the name of the dog used as a model in the painting that eventually became RCA’s logo, is really misnamed. 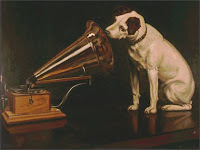 In honor of that miserably old dog that waited twenty years just to hear--once more before he died--his master’s voice, RCA’s mascot should be re-christened Argos. The synthesizer’s key place in sixties rock began in June 1967. Paul Beaver and Bernie Krause (the recording duo of Beaver & Krause) set up a booth on the Monterey fairground as part of the Monterey International Pop Festival in June 1967 in order to promote, and perhaps even sell, the Moog synthesizer. They actually sold several. According to Pinch and Trocco, “Monterey was the place where the subculture became mainstream” (117). What you've written here about the Moog and Leslie confirms what you wrote earlier about psychedelic music not being truly psychedelic in character until it was defined as such verbally -- at least to the extent that psychedelic music would have sounded a great deal unlike psychedelic music as we know it, had these two musician's friends not been introduced during this fertile period. I've been fascinated with the different musical applications of the Leslie amp, ever since puzzling for years over the meaning of a STEPPENWOLF THE SECOND track called "Hodgepodge Strained Through a Leslie." One of the most interesting uses I've heard can be found on Jefferson Airplane's live album BLESS ITS POINTED LITTLE HEAD. In their performance of the Donovan song "Fat Angel," a few band members swapped instruments -- bassist Jack Casady played rhythm guitar, singer Marty Balin played the simple bass motif, and rhythm guitarist Paul Kantner was freed to focus on little psychedelic grace notes and arabesques, all strained through a Leslie. The Leslie also had the capability of making vocals sound antiquated, as though they were winnowing down through the '60s from an old '20s Victrola. This may have had something to do with the musical interest shown in 1920s sounds during this period, as I touched upon in a previous comment. Another early album to feature Moog synthesizer was PISCES, AQUARIUS, CAPRICORN & JONES by The Monkees. Paul Beaver played it, primarily (check out "Star Collector," which a cursory lyric check reveals to be about a plastercaster!) but Micky Dolenz was supposedly one of the first rock musician/personalities to acquire one. I was on the point of mentioning that another great Moog/Leslie album is the self-titled release by the short-lived United States of America, released in 1968... which may be the case, but I recall that some of the vocals were sung through a device called a Ring Modulator, also useful in those psychedelic times. That little item might be another interesting topic for you, one of these days. The Monkees' recording of Goffin & King's "Star Collector" is significant, in that it was the first time that a Moog Synthesizer was used to play actual musical notes, and not just weird sound effects (like on say, The Byrd's "CTA-102"). A year later, the Turtles had a couple of AM hits that prominently featured the instrument used in the same capacity, "Eleanore" and "You Showed Me."